Come live where the Pacific ocean meets with modern design and sophistication in this fully furnished, former model home! From the moment you open your front door you are greeted with unmatched ocean,Catalina,harbor,Queen Mary,city and coastline views! These views are maximized by having floor to ceiling windows that frame these amazing views from the 28th floor. The interior is fully furnished and will be sure to impress with granite counter tops,stainless steel gas appliances and more! 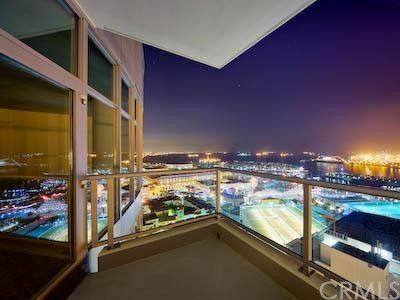 Modern design in a comfortable setting within Long Beach's most luxurious complex make this a must see. As a resident in West Ocean Towers you will enjoy all of the unmatched West Ocean signature services and amenities. West Ocean has 24 hour concierge,security, two fitness centers, pool,spa,sauna, billiard room, multi media room, poolside fireplace, two conference centers, wine room and so much more...Make this dream lifestyle your reality today!